I am asking myself this question right now, and I know you are too. So this post explores the issues that I know many marathoners obsess about in the weeks prior to our race. Yeah, I said obsess. And I said it loud and proud. I know some of our Salties and many of our fabulous readers are zen runners. You run because you love running and love feeling the cool air on your face. Your hair is blowing in the wind and you feel free. Yeah, I like that too. Actually, I love it too. But even more, I love pushing myself to my limits during my training cycles and on race day. I love the feeling when I have to fight really hard hard through a ridiculously tough workout but I complete it anyway because I.will.not.quit. And I love taking myself to the edge and putting it all out there on race day. Even if it means failure. There is no zen about my race strategy. Yes, I try to enjoy it and often do. But my race is executed with my complete competitive tigress in full action. I want to rip the roof off whatever city I am running my marathon in. I am not an elite runner by any stretch, but I am an elite version of myself. I work hard, set my sights high, and strive to prove to myself that I can always do better. Even if that means I only improve by a few seconds. Seconds. Yes, I’ll get up at 3:30 am to get a run in, worry about my paces, try to fit in extra miles, and kick my own @ss season after season because on race day – I want to see what I am made of. Plain and simple. I may fail (and have many times which is agonizing when you’ve worked for months). But I will lay it all out there and put all of my eggs in one basket for a few hours in one day. That is actually what I commit to each season. It is just how I am wired. Go big or go home! So for the like-minded folks out there trying to figure out where you are at before your fall mary that you want to dominate, let’s have a chat. 1. Did You Complete Your Scheduled Workouts? Revisit your training schedule and training log. Did you hit all of your workouts? Of course we all miss a workout here or there to roll with whatever life throws at us – that is okay. But overall, did you get in those critical long runs, tempo workouts, VO2 Max workouts? (Or whatever you want to call them). If you missed a substantial amount of your runs, you may want to rethink your goals. If you nailed them, yep looks like you may have a chance at hitting that PR. I will go ahead an admit that every season – never fail – during my training I take some time to look back at my training log to really see how the season went. Sometimes we get caught up in the day-to-day grind of training, so it can be very useful to get some perspective looking at the whole season. 2. 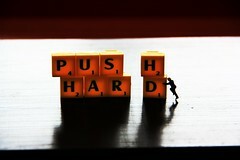 Did You Push Yourself Hard Enough? So you got out there, but did you really push yourself? Did you run the paces you were supposed to? This is a hard one and controversial one since there are so many different approaches to training. BUT, I think it is worth asking the question: did you nail your workouts or trade in the tempo runs for easy miles. I know in various seasons I have slacked on my paces/workouts and added a few more miles instead. While high volume is great, it can’t replace the quality you need in marathon training. 3. Did Training Beat You Down? Did you have a few workouts where you simply couldn’t nail your paces? Maybe it was your third hard workout for the week and you were getting near the end of the season – was it just too hard? Or if you did make it, did you notice the effort was WAY harder than it should have been? If yes, maybe that isn’t so bad. It stinks mentally when this happens (and let’s be honest, physically too), but when I was reading around about it, several people opined that if you aren’t having it hard those last few weeks of training (read: 3-6 weeks out) maybe you aren’t pushing yourself hard enough. Again, I have no science, but interestingly enough, all of my friends on Daily Mile that are in peak marathon training mode right now are suffering now. Coincidence? Who knows, but I would guess they are pushing hard enough to reach that peak come race day (or are in #4 below). Am I trying to justify a crappy workout or 2? Maybe, but I don’t think so. I am also not inferring that if you consistently can’t hit your paces you are on track. But if at peak training it is ridiculously hard – it shouldn’t crush your confidence. You may just be nearing your sweet spot for an awesome race. Yes, I have to ask: are you injured? When we train at peak level (and this is individual – not for elites only) we teeter on the edge of having a break-out performance or not even hitting the start line due to a debilitating injury. It is not a happy truth, but if there is a universal theme in our sport, it is injury. So as you eye up race day, ask the honest question: are you injured? This isn’t black and white. I just entered my first week of taper and my left heel hurts and my hamstrings feel like violin strings. But I know my body well enough that I just need some extra stretching and R&R that the taper will bring. Other times we know that the pain in our foot may legitimately be a lot more. A stress fracture or serious muscle injury? Ask Desi Davilla, Ryan Hall or Abdi Abdirahman about it. Or ask anyone of us mortal runners who has suffered the same fate. It is an unfortunate reality that no doubt comes into play when we are honestly evaluating where we are at. Don’t ignore it. 5. Have You Noticed Progress? One of my favorite taper activities is looking back at my workouts – not only for the season, but in seasons past. Where am I comparably when it comes to pace / heart rate / quality / mileage? This can give you great confidence (or humility), and it can be very eye-opening, so I advise you to check it out. If this is your first marathon (or even second or third), focus on this season alone. How are you doing now compared to a few months ago? My guess is pretty great. In that event, trust in your training. 6. Have You Simulated Race Conditions? We run happy when we are ready! Have you run much at race pace? How does it feel? This one comes with a big fat asterisk because running marathon pace during heavy training is a LOT harder than it is on race day after a taper. But have you done it? Are you getting used to how it feels? If yes, how does it feel? Are you okay or redlining it? Have you run any tune-up races? These can help give you confidence – or hopefully at least let you know what ball park you are in. 7. Are You Properly Tapering? I don’t care how awesome your training season went, if you don’t cut back and taper properly, your race will be like most of your long runs rather than peak performance (read: hard). I seriously believe the taper is magic. I know some who cut it short and mess with it, but for me, more rest is better. And by that, I mean cut your mileage, but keep the quality. You’ll keep your body tuned up (speedy) and rested at the same time. Magic. 8. Do You Have Your Mental Game On? We love to talk about mentally preparing for races on Salty Running – and for good reason. I don’t recommend that you ask yourself whether you are in peak shape to fall off a cliff of anxiety. I offer this because as marathoners – generally we are very competitive with ourselves and we want to do our best. REALLY BADLY. So we are going to evaluate all of the above – whether it is conscious or not. So when you do, evaluate with a positive attitude. After all – you did work hard this season. Hopefully the above ideas will not only give you suggestions for getting ready for the race, but will put you in a positive place for what you are capable of. Then go out and get it. The sweet success of a well-executed marathon is hard to replicate. So get after it and then let us know how awesome you did. How do you know if you are ready for a break-out marathon? How do you know when to re-evaluate? Share what “peak” fitness means to you – we want to know! Next I Am Not a Cyclist. But I Tried CycloCross Anyway. Great post Mindi – I think too many runners are afraid to indeed push the edge during their training, knowing that they may get injured in the process. I’m coming more and more around to the thinking that, yes, easy running has it’s place, but we (in the US especially) seem to have adopted this view that you can run your best marathon just by doing long slow runs, short intervals, and a few tempo works. I’m adopting more of Renato Canova’s view that questions this – “what does a two hour slow run have to do with the marathon? Absolutely nothing.” (to perhaps paraphrase a bit). That being said, I’ve missed two of my last three marathons due to injury, and am teetering on the edge now (though I’ll argue this situation actually wasn’t caused by running) – but I’m not sure I’ll back down in the future, rather just try to find other ways to strengthen myself to be able to better handle this type of training.